Recently, the Environment Protection Agency (EPA) published a report of drinking water quality in Ireland in 2016. The document highlights the issues of drinking water in public water supply and the information has been published in national newspapers including Independent and Irishtimes. We’ve put together the most important information about the drinking water quality in Ireland you shoud know about. 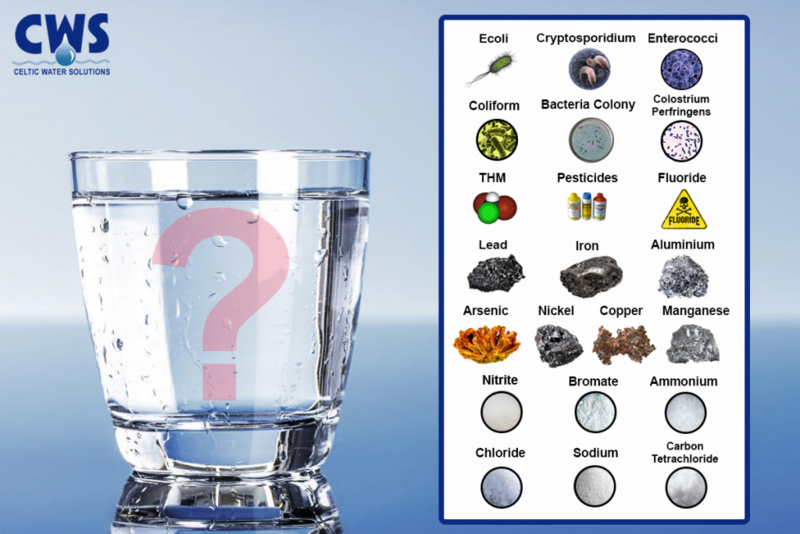 What are the contaminants found in drinking water supply? In 2016, EPA issued several boil water notices and restrictions that were aimed to various places in the country. Also, contaminated water was detected in several areas and other issues were uncovered. ● Many dangerous chemical and microbiological contaminants detected across the country. ● 41 boil notices and 10 water restriction notices were in place in 16 counties affecting 84,348 people. ● The largest supply affected by a boil notice or water restriction during 2016 was the Lough Mask supply in Co. Mayo, which serves 39,435 people. This boil notice was issued following the detection of Cryptosporidium. ● A boil water notice was also issued on the Whitegate Regional supply in Co. Cork on three occasions during 2016 affecting a population of 10,392 each time. Concerns here were of potential risk to human health due to elevated turbidity and the detection of Cryptosporidium. The final notice was issued in February and remained in place until October. ● The majority of public water supplies in Ireland use surface water (rivers and lakes) as their source. These serve 81% of the population. Rivers and lakes are much more exposed to potential contamination than groundwater and springs, which serve 12% and 7% of the population respectively. ● During 2016, the EPA received and assessed 854 notifications of drinking water quality failures in public water supplies from Irish Water, up from 744 in 2015. This was mainly due to an increase in the number of pH and iron failures (indicator parameters) being notified to the EPA. There were 377 people affected by a boil water notice for E. coli in 2016. E. coli was found in 3 water supplies. Microbiological parameters, and especially E. coli, are the most important health indicators of drinking water quality. If E. coli is presented in water, it means that there is contamination in the water distribution system. There were 163,809 people on 32 supplies listed on the Remedial Action List due to the risk from Cryptosporidium and 58,938 people on Boil Water Notice due to a risk from Cryptosporidium in 2016. Cryptosporidium was detected in 12 water supplies. Cryptosporidium is a parasite that is found in human or animal waste and can get into the water supply system. If drinking water contains cryptosporidium water users can get infected and suffer from diarrhoea. Trihalomethanes (THMs) are chemicals that can form when organic matter in the raw water, such as decaying vegetation, reacts with chlorine in the disinfection process. This is a particular problem in Ireland because of the large amount of supplies using surface water (rivers and lakes) as their source. The presence of THMs should be minimised by optimising the removal and treatment of organic matter without compromising disinfection. The standard for THMs in drinking water is 100 µg/l. The EPA Remedial Action List (RAL) highlights the water supplies that pose a risk to consumers, and are, therefore, in need of improvement. At the end of 2016, there were 99 supplies on the RAL. Of these, 71 are supplies where THMs exceeded the standard. These 71 supplies serve 464,718 people. Lead can negatively affect nervous system, especially at infants and young children. The most commonly found pesticide in drinking water is MCPA13 which is used for rush control in grassland. Pesticide products should not be present in drinking water. MCPA is usually detected in the months of May/June/July and in September/October. This is because MCPA is applied to grassland in these months for ragwort, rush and thistle control. At the end of 2016, 63 supplies serving over 900,000 people had open investigations due to failures to meet the pesticide standard. 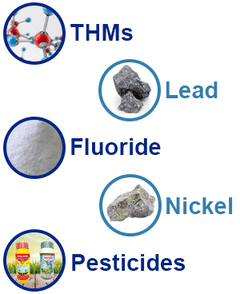 According to the HSE’s regulation, public water supply has to be fluoridated, however there are many strudies that show that fluoride should be completely removed from drinking water as it might have a negative impact on human health. There is an exact amount of fluoride presented in drinking water supply that shouldn’t be exceeded. The national standard is 0.8 mg/l. In 2016, 21 samples (18 supplies) failed to meet the national standard. 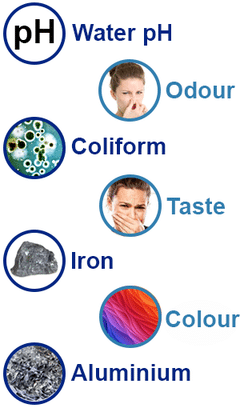 Major issues: pH, Odour, Iron, Colour, Aluminium, Coliform Bacteria, Colony, Turbidity. The pH value is a good indicator whether water is hard or soft. There are different pH values measured depending on where the water comes from – e.g. surface water or groundwater. The pH value of pure water is 7. If the pH value of water is higher than 7, it is considered to be basic and with lower than 7 is considered to be acidic. The normal range for pH in surface water systems is 6.5 to 8.5, while the pH range for groundwater system is between 6.0 to 8.5. In general, water with ph lower than 6.5 could be acidic and corrosive. And acidic water can contain elevated level of toxic metals and can cause damage to metal pipes and as a result, the taste of tap water is metallic or sour. Acidic water can also cause “blue-green” stains on sinks and drains. More importantly, there are certain health risks associated with toxic metals that get inside your body when you drink acidic water. Water with bad taste and bad smell is not acceptable to the water users, also it can be a sign of issues with the source water or the treatment works. It’s proven by healt care specialists that exceeded amount of Iron is harmful to health and so its level in drinking water should be regulated. It can also discolor your laundry and leave stains in sinks. Similar to odour or taste of drinking water, an unusual color of your tap water such as brown can be a proof that water contaminanats are presented in your drinking water. For example, brown (or red / rusty) color very often indicates there is iron or magnese in water. Foamy white water is usually a result of turbidity. Aluminium may appear in drinking water because of the use of aluminium sulphate as a coagulant to remove solids from the raw water during the treatment process. An excessive level of aluminium (the standard is 200µg/l ) was found in 44 supplies in Ireland during 2016. A failure to meet the national standard means insufficient control over the coagulation process. Caliform Bacteria can be found in animal and human feces and can easily get into contact with well water. This type of bacteria can cause a disease called diarrhea. Bacteria is put on plates and incubated at 22 °C and for 24 hours. After that, size and color change and bacteria colonies can be seen without using a microscop and can be easily counted. Harmful bacteria colonies were detected in 22 water supplies tested by the EPA in 2016. The control of turbidity is one of the indicators of the efficiency of treatment at the plant. High levels of turbidity in water indicate that the water treatment process is not operating adequately. It also provides a good indication of whether the treatment plant is capable of removing Cryptosporidium. How can you treat water in your home to remove all contaminants and have safe drinking water for the whole family? 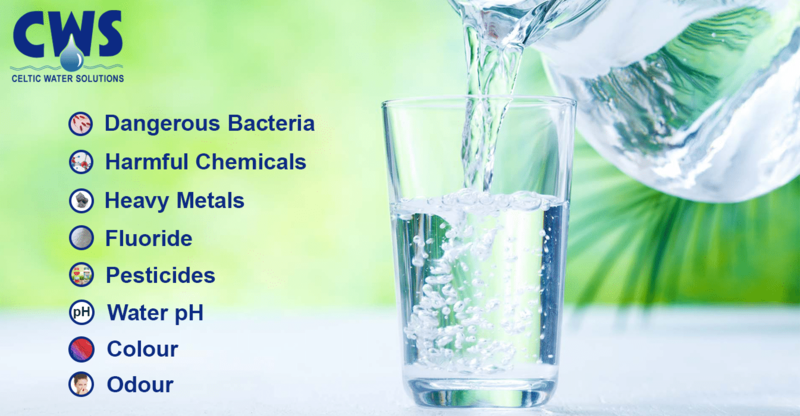 CWS Water Solutions offers a wide range of quality water treatment products such as water softeners, drinking water systems (e.g. reverse osmosis) or water coolers and water treatment services including water sampling, water systems installation and regular service. The company founders have over twenty years experience in the industry. CWS is highly focused on customers satisfaction. Our expert team is excited to hear from you and will assist with the complete water treatment proccess! In conclusion, there is a high level of disinfection of water by-product (THM), persistent pesticide failures in some supplies and there is still large numbers od lead pipe connections in properties where water is flowing through. Many other water quality indicators didn’t meet their standards in 2016. However, there is a solution – you can protect yoursef from all the contaminants and improve qualitity of drinking water in your home by installing a suitable water system. How shocking is this information about the water quality in Ireland for you? Do you know how quality your drinking water is?